Decorating our homes in the Holidays is one of the best traditions there can be. Inside, we create a cozy atmosphere to celebrate Santa’s arrival, but keeping things beautiful on the outside is also important. 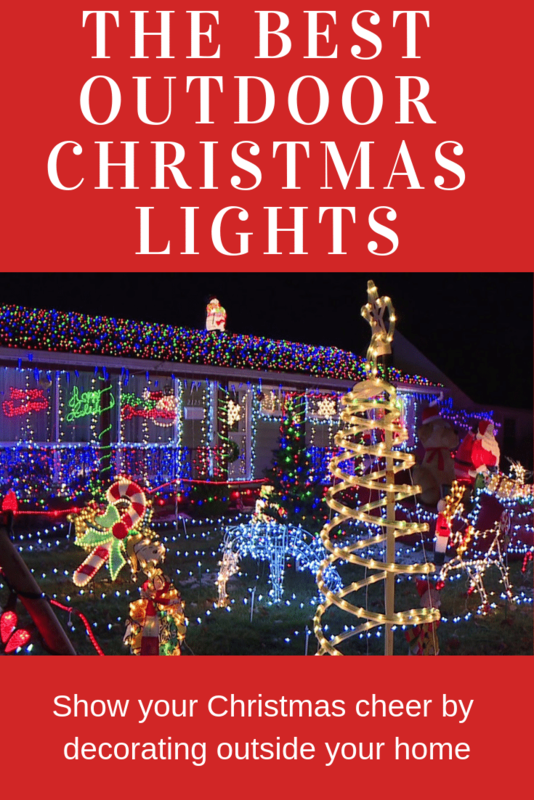 One of the coolest ways to decorate our yard, porch, driveway, and outdoor area is by using Christmas lights. 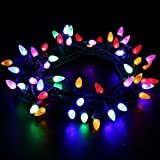 There are many choices, be it pure, white lights, or fun and colored ones, with vibrant red, blue, green purple and yellow. There are even some projectors that can shower the walls with thousands of colors while playing Christmas music. 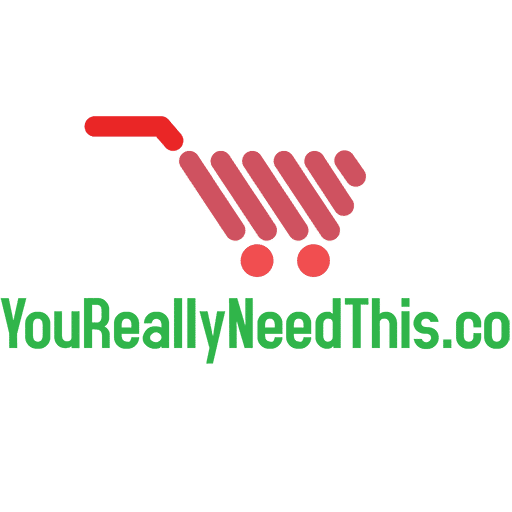 If you’re looking to decorate your shrubs, palm trees, and all your outdoor space, take a look at these Christmas lights for outdoors that can fit most of your needs and create that special Christmas Holiday feeling you love. 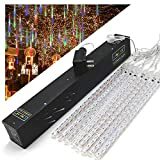 This is a string of LED lights made of 25 bulbs that are spaced by 8 inches each and are outdoor rated, so keeping them outside will be no problem. Their LED technology uses up to 90% less energy than conventional bulbs, and have a live rating of 100,000 hours. More than enough to last for several seasons. 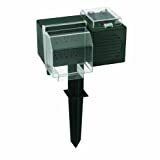 The lights include rectifiers to eliminate flicker, strobing, and pulsing, for a beautiful light display, and have a fused plug to prevent any short circuits. The plug includes a couple of extra replacement fuses, and on the end of each light there a female plug so you can connect sets end to end. You can actually connect up to 80 of these light sets together, allowing you to cover any space you want. These LED lights will create a charming and lasting impression and are perfect for the holidays. Each string has 8 tubes, and each tube has 18 LEDs, making a total of 144 LED lights. The tubes are 30 cms in length and are waterproof and UL listed. They are also dustproof and corrosion resistant. The length of this lights set is 18.6 ft, with LED C3 bulbs that are 4 inches apart. 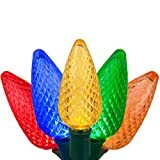 There are 50 bulbs per set, and you can connect up to 40 strands end to end. The lights are UL certified, with a plug that has a built-in fuse protection, with two extra fuses included. The mini-strawberry lights create a cozy feeling and use less energy than conventional bulbs. You can use them also indoors but are perfect for decorating exterior areas like the patio, balcony, yard or porch. Their estimated lifespan is 3,00 hours, and in the box, you get a couple of replacement bulbs. Pick your favorite color, they are available in blue, warm white, cool white, and multicolor. If you have a large area to cover, this rope light has 164 ft of super bright LEDs. It can be used both inside and outside the home, as it’s rated as waterproof. You don’t need a special adapter or anything like that, just plug it into any normal 110-120 AC outlet. The clear PVC tube is very flexible and durable. You can shape it to cover any area you need. Bend it to any angle so it will fit perfectly into the space you want to decorate. It can even be cut every 3.3 ft along the cutting marks it has printed on. The coolest thing about this light rope is that it includes a remote control. With it, you can increase or decrease the light’s brightness, turn them on or off, select the colors to be turned on, and use one of the fun effects: colorful jumping, roundest flashing, colorful gradient, and dynamic model circulation. If you need a shorter length, the LED rope light is also available in 32.8ft and 65.6ft versions. Hanging lights and decorating can be a hassle. If you’d rather go for the quick and simple option, this is perfect for you. You’ve probably seen the ads for this star shower on TV and wondered if they actually work. Well, they do! This Christmas lights projector has thousands of glowing reviews from customers that are delighted with the results. Thanks to its extra-long stake, the projector can easily be placed in your yard. Point it to your home and shower it with thousands of tiny laser lights. You can choose between showing just red lights, just green, or have them both mixed together, and select between a fixed or motion effect. Instead of having to remember to turn off the lights each morning, this projector has a built-in sensor that automatically turns it off once the day arrives, and on again at night time. It is weather resistant and can withstand the elements, be it rain or snow. Some customers have even said that their device was left out in the harsh weather of Minnesota in winter and kept working without problems. Enjoy a warm and romantic ambiance with these solar powered string lights. Made with thin and flexible copper wire, you no longer are restricted to just hanging the lights, but can also bend the string to cover any shape you want. Each string is 33ft long and has 100 warm white LEDs. With a full charge they will be lit for up to 8 hours, and you can pick one of the 8 different light modes: steady on, twinkle, fading slowly, combination, chasing, fireflies, waves, and fading. The built-in sensor will automatically turn the lights on at night and off when the morning comes. 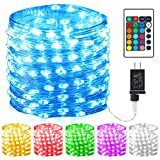 The lights are waterproof and heat-resistant and can be used indoors or outside without any worry of moisture or harsh weather. 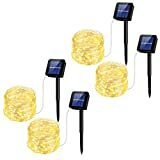 With your purchase, you receive a pack of 4 solar powered lights, each one with a stake to place them in your yard. With a length of 33ft, this string includes 100 LED lights that can light up in 16 different colors. It is made of flexible wire that can be bent to any shape, allowing you to create unique designs, and rated as IP67 waterproof, for outside use. The lights can be operated with a remote control, that lets you do things like turning them on or off, set a timer, switch to any of the 16 colors, or use one of the lighting modes for a fun effect. 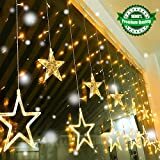 This string of lights has 6 big stars and 6 small stars and a total of 138 LEDs that emit a warm white glow, and the string is 6.56ft long. Big stars measure 7.8 inches, and the small ones are 5.9 inches. The LEDs are rated as waterproof IP44 level and are perfect for decorating windows at Christmas time, or during all the year since they look amazing. You can leave them on all the time, or use one of the 8 different modes: combination, in waves, sequential, slow-glow, flash, slow fade, twinkle, and steady on. Celebrate this Christmas season in style with these lovely candy canes. Each one is 22″ tall and has 6 bulbs. The total lighted length is about 18 feet, and there are spare bulbs and fuses included in the box. 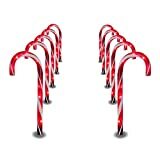 The candy canes have a short stake attached so you can use them in your yard or pathway, and up to 5 sets can be connected end to end. Made of hard plastic and weather resistant, they can be used outdoors with no problems. Take off the stake and use these lights indoors, or hang them on a tree for a cool effect. Surprise your neighbors and be the talk of the town with this device that lets you build an outdoor musical light show. It has 6 outlets for plugging in your lights, and 20 preprogrammed Christmas carols. Each outlet can power up to 1,200 miniature lights, for a total of over 7,000 lights! Designed for outdoor use, the player has an onboard speaker with volume control and you can play the songs randomly, pick your favorite ones, or skip the ones you don’t like. If you’d rather have the lights on with no sound, you can do that also by pressing the mute button. These are the songs that are included: 10siberian orchestra style, God rest ye merry gentlemen, Angels we have heard on high, Here we come a-caroling, Deck the halls, Carol of the bells, Good Christian men rejoice, We three kings of Orient are, Joy to the World, O come all he Faithful, The twelve days of Christmas. There are also 10 rock n roll carols: Jingle bells, We wish you a merry Christmas, Frosty the snowman, Have yourself a merry little Christmas, I saw three ships, Here comes Santa Claus, Santa Claus is coming to town, Winter Wonderland, Let it snow, and Sleigh Ride.